The Israeli Air Force carried out, on Saturday afternoon, dozens of airstrikes targeting sites, reportedly run by armed resistance groups, and the areas around them, in several parts of the besieged Gaza Strip. 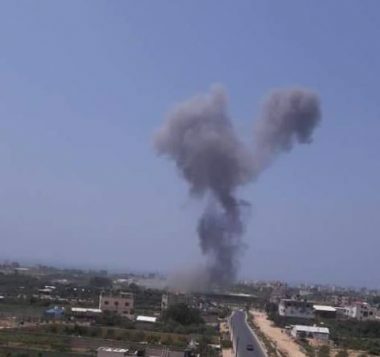 The Israeli war jets fired at least four missiles into a center near the Egyptian border, in Rafah, in the southern part of the Gaza Strip, causing serious damage. The Air Force also fired at least three missiles into a Palestinian land, close to the barrier fence, east of Gaza city. Furthermore, the Israeli Air Force fired several missiles into a site, southeast of Gaza city, in three consecutive strikes. Israeli missiles were also fired into an area in central Gaza, causing property damage, in addition to areas in Beit Lahia, in northern Gaza. On his social media accounts, Dr. Ashraf al-Qedra, the spokesperson of the Palestinian Health Ministry in Gaza, has confirmed that the Israeli strikes did not lead to casualties; the statement came after some media agencies reported three injuries. However, Dr. al-Qedra issued an advisory warning to the Palestinians to refrain from gathering in or near the targeted areas, especially since the air strikes have targeted the same areas more than once. In addition, armed resistance groups in Gaza said they retaliated to the Israeli strikes by firing fifteen shells into Israeli areas across the border fence. The Israeli army claimed its fired missiles into a tunnel, reportedly run by al-Qassam Brigades, the armed wing of Hamas. On Saturday at dawn, the Israeli Air Force carried out five strikes against armed resistance sites in several parts of the coastal region. It also quoted the Israeli Army spokesperson Ronen Manelis stating that the military struck 40 Hamas centers, in what he called “the biggest daytime attack” since the 2014 “Protective Edge” military offensive on Gaza. It is worth mentioning that the Israeli offensive in 2014 has led to the death of 2,219 Palestinians – most of them are civilians, when the army obliterated 142 families. On Saturday morning, the Palestinian Health Ministry said a young man, Mohammad Nasser Shorab, 18, died from serious wounds he suffered, Friday, after Israeli soldiers shot him in southern Gaza. On the same day of his injury, the soldiers killed a child, identified as Othman Rami Hallas, 15, from the Sheja’eyya neighborhood, east of Gaza city. The Palestinian Centre for Human Rights (PCHR) said the soldiers also injured 95 Palestinians, including 17 children, three women, two paramedics and two journalists.